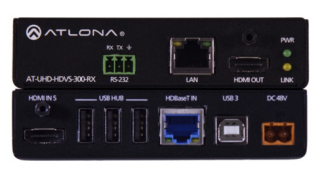 Atlona has added to its commercial AV offerings the SW-5 Series of 5-Input 4K switchers– with the release of its new AT-UHD-SW-5000ED series. The model has two HDBaseT inputs and mirrored HDMI/HDBaseT outputs, offering integrators more flexibility in designing boardroom, classroom, and other AV presentation systems. The SW-5000ED supports 4K/UHD@60 Hz, 4:2:0 video (10.2 Gbps) and transmits AV signals along with Ethernet, Power over Ethernet, and control over a cable to displays up to 328 feet (100 meters) from the switcher. Built-in control options include auto-switching, front-panel buttons, and compatibility with IR, RS-232, or TCP/IP-based control systems. The switcher also offers three HDMI inputs and audio de-embedding of digital audio from HDMI to two-channel, balanced analog audio. Two Atlona HDVS transmitters can be used in one system enabled by -75 walls of the The AT-UHD-SW-5000ED. It is ideally suited for presentations that are given from two or three locations in a room, such as from a lectern, a conference table, or other location in a classroom or lecture hall. The switcher also supports the Atlona Management System (AMS), a network software platform that integrates product configuration, management and updating, enables remote monitoring and support, and provides other features. Displays connected to the SW-5000ED can be turned on and off using IP, RS-232 or CEC control. Additional features include a web-based GUI for brief set-up and management of EDID, HDCP, display control, and USB and LAN ports for firmware updating. The new SW-5000ED has a 1U, a half-rack width enclosure with 19” rack-mount brackets that allow two units to be mounted side-by-side. The SW-5000ED also carries the Atlona’s 10-year warranty. The AT-UHD-SW-5000ED switcher will be available in May 2016 for an MSRP of $1,549.95.